Hang Tag Parking Permits - Durable, yet flexible parking permit tags can be removed and used on different vehicles - perfect for temporary parking control. Screen printed on white polyethylene or laminated materials. Municipal Stickers/Parking Permits - Die Cut municipal stickers are kiss cut and supplied on a backing sheet, making removal quick and easy, just bend and peel. Consecutive numbering included in cost. School Bumper Stickers - Show your school spirit. Membership Cards - These durable, screen printed plastic cards can be used for school ID cards. Bookmarks - Full color bookmarks are a fantastic way to encourage students to do their best. Ribbon Magnets - Ribbon magnets can be customized with school logo, mascot or message. 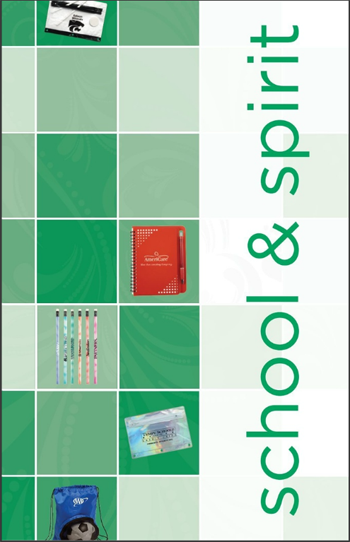 If you do not see a Custom Imprinted Education or School Item above that suits your needs please contact us. We can create custom products from you specifications. Artwork design services are free of charge.